Learn survival trapping and game-processing techniques for emergency and long-term survival situations. 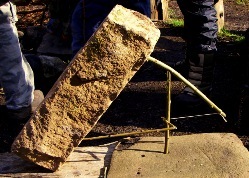 Primitive trapping techniques were utilized by indigenous hunter-gatherers the world over as a means to procure food sustainably. Wild game is often the primary source of calories, fat, and protein in a wilderness survival situation, especially in winter. This course course covers safety, ethics, construction, placement, and tracking techniques for trapping; as well as processing wild game (skinning, gutting, and butchering). The class includes practical hands-on practice with making primitive traps with carved sticks and natural plant fiber cordage. Instructors demonstrate processing game. Each participant makes several traps to test and take home. The course also covers track & sign identification for wild game species. The class is a mixture of engaging presentations, demonstrations, and ample hands-on field practice.